When Indianapolis was selected to host the Super Bowl in 2011, new public spaces were needed for visitors and spectators alike. Landstory’s focus became the design of a myriad of public spaces formed by the new Marriott Hotel campus, the public plaza along West Washington Street and the Convention Center Ballroom facility. 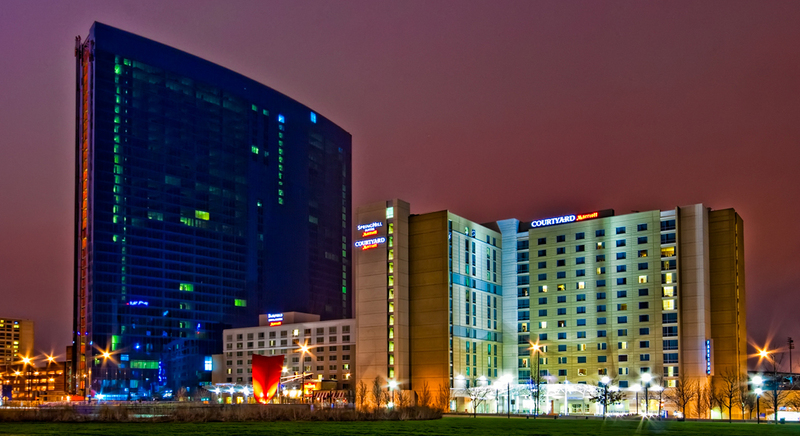 The White Art Plaza formed by the facades of the JW Marriott, Fairfield Inn and Springhill Suites, incorporated three important Indiana state symbols; the flower, tree and bird. A forty foot stylized red cardinal, the state bird, appears to be perched on a decorative tulip branch, the state tree. The tulip tree is reflected in the decorative pavement surrounding the cardinal sculpture. Parallel to the street is a mosaic water wall depicting fields of peonies, the state flower. The patterns of the surface pavement along West Street are oriented to reinforce views of significant facilities nearby, including the Indiana State Office Building, the Eiteljorg Museum and White River State Park. When Indianapolis was selected to host the Super Bowl in 2011, new public spaces were needed for visitors and spectators alike. Landstory’s focus became the design of a myriad of public spaces formed by the new Marriott Hotel campus, the public plaza along West Washington Street and the Convention Center Ballroom facility. The White Art Plaza formed by the facades of the JW Marriott, Fairfield Inn and Springhill Suites along Washington Street, incorporated three important Indiana state symbols; the flower, tree and bird. A forty foot stylized red cardinal, the state bird, appears to be perched on a decorative tulip branch, the state tree. The tulip tree is reflected in the decorative pavement surrounding the cardinal sculpture. Parallel to the street is a mosaic water wall depicting fields of peonies, the state flower. The patterns of the surface pavement in the J. W. entry drive on West Street are oriented to reinforce views of significant facilities nearby, including the Indiana State Office Building, the Eiteljorg Museum and White River State Park. Written by laadmin on July 13, 2017 . 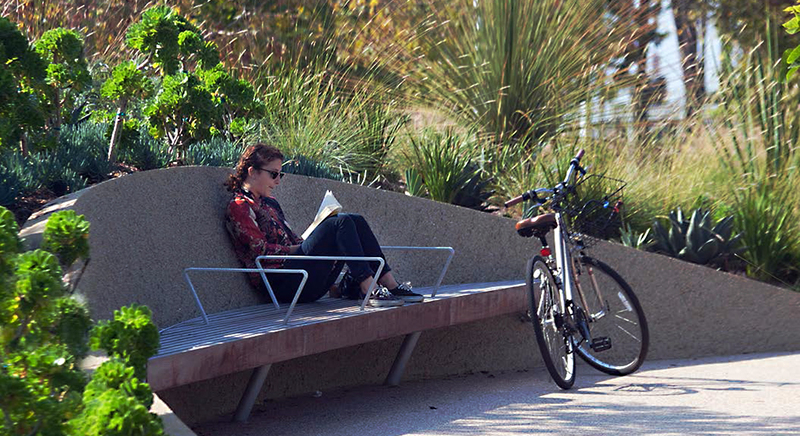 Integrating sustainability without compromising design is one reason clients choose Landstory. The firm’s proven experience and knowledge gave this international medical diagnostics company the advantage when it came to renovate their current corporate campus in Indianapolis. Rain gardens, bio-swales, subsurface detention and native plantings combined for a comprehensive and innovative storm water management solution. A central common space incorporates a large event lawn, custom shade canopy, outdoor dining court and native prairie planting all connected by sweeping walkways. Landstory collaborated with a team of national firms and served as the project’s Landscape Architect of Record. Written by laadmin on July 10, 2017 . The award-winning design of the IU Melvin & Bren Simon Cancer Center serves as a public reminder of the impact of cancer and how it affects all of our lives, directly and indirectly. One of Landstory’s goals for this project was to bring awareness, meaning and a sense of optimism to patients suffering with the devastation of this disease, through the design of the outdoor spaces and inclusion of public art. 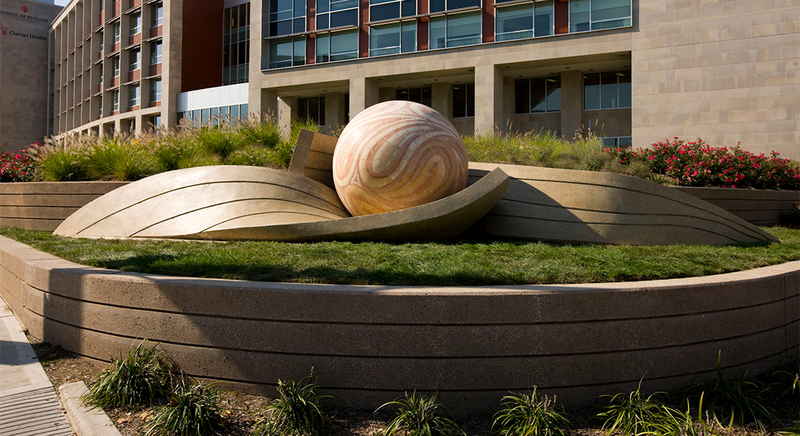 On the corner of the site is a five foot onyx sphere, gently encased in two concrete ribbons, symbolizing the nurturing of a healthy cell, symbolizing hope. Sustainable solutions were central to the design and includes 75,000 square feet of green roof packed with plants native to Indiana mitigating the negative impacts of surface storm drainage.